The European Commission proposed a ban on imports of fish from Sri Lanka for not tackling illegal fishing properly and lifted a ban on fish imports from Belize following the reform of its vessel inspection practices. The Commission on Tuesday also lifted warnings on Fiji, Panama, Togo and Vanuatu, saying they had implemented concrete measures to combat illegal fishing. The four countries thus avoided being placed on the “red list” of nations that are not allowed to sell fish to the 28-nation European Union, the world’s biggest fish importer. “Our policy of resolute cooperation is yielding results,” EU Maritime Affairs Commissioner Maria Damanaki said in a statement. Since 2010 the EU has taken action against countries that do not follow international standards to prevent over-fishing, such as policing their waters for unlicensed fishing vessels and imposing sanctions to ensure adherence to rules against illegal fishing. Damanaki said Sri Lanka did not even have proper legislation in place to prevent and fight illegal fishing, which led the Commission to put forward the import ban. The proposal from the Commission, the EU’s executive, to ban fish imports from Sri Lanka will be discussed by EU member states before the end of the year and if agreed will take effect from mid-January 2015. The states will also have to sign off on the lifting of the ban on Belize and of the warnings on Fiji, Panama, Togo and Vanuatu. 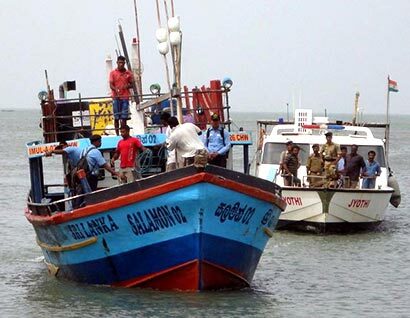 EU fishing vessels will not be able to operate in Sri Lanka’s coastal waters if the import ban takes effect in 2015. Sri Lanka is one of the biggest exporters to the European Union of high value fishery products such as swordfish and tuna. EU imports in 2013 amounted to 7,400 tonnes of fish worth 74 million euros ($94 million), according to the Commission. The three months before the import ban comes into effect will also allow Sri Lanka to address the EU’s concerns by, for example, implementing international maritime law obligations and putting in place an efficient vessel monitoring system and a sanction scheme for high seas fleets, the Commission said. The bloc has banned fish imports from Cambodia and Guinea over illegal fishing since March, and it delivered a formal warning to the Philippines and Papua New Guinea in June. A review of these countries’ progress in tackling illegal fishing is expected in January next year. Campaign groups such as the Environmental Justice Foundation, Oceana, the Pew Charitable Trusts and WWF welcomed the Commission’s announcement for continuing the fight against illegal fishing. Fish caught illegally are worth up to 10 billion euros a year, according to the Commission.